So first, we have to setup the environment for heroku server. First, we nid to tell the server what python libraries to download and we can easily do that with pip, with the freeze function to get all the dependencies downloaded. Mainly, this will include web.py and whatever dependencies you have downloaded for your project. This saves all the dependencies into requirements.txt, a file which heroku will use to tell what to download. The Profile consist of all the dynos that will be requried to run your application. The most basic of all application uses one dyno only, which is the web. This dyno allows your app to run and liten to HTTP request. The variable $PORT, is a envrionment variable defined by Heroku and will result in the application attaching to the pre-defined port number. Heroku uses git to manage its project. And you can copy the git link by going to your project dashboard and put the link into your project as heroku. After that you just git push heroku master to push your project online. 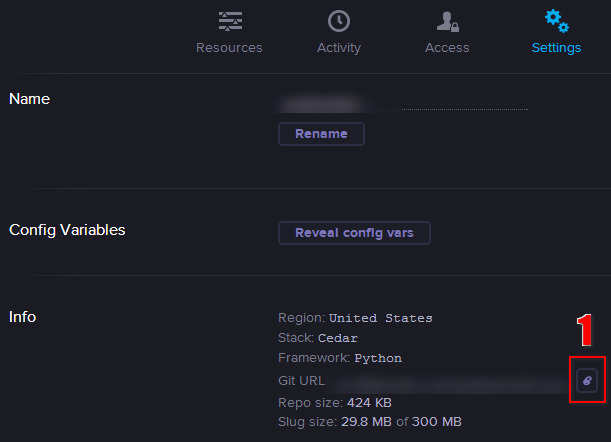 You will see Heroku setting up your application, downloading all the neccessary dependencies and running the dynos. If you receive any error about not being able to authenticate with Heroku, visit my tutorial here to learn how to setup your Git with heroku. Push technology, is a style of internet based communication where the request for a given transaction is initiated by the server, rather than the client. This is especially useful for applications that require real time updates. Long polling is not a true push, but given the restricted web environment where incoming HTTP requests are restricted, it emulates the push function sufficiently well. With long poll, the client requests information in exactly the same way. If the server does not have the information required, instead of sending an empty response, the server holds the request until the information becomes available. Once the response is sent to the client, another request is fired again until the server returns with the information requested. The application will be done with web.py in the back end, serving the web pages for index / and the message submission page /add, alongside responses to http request /get for new updates. The messages submitted will be stored on a sqlite database, chosen for its simplicity and size. The request send to /get will include a timestamp, whereby only messages sent after that timestamp will be return. So, in this tutorial, we will be using a standard XMLHttpRequest to send request to the server to obtain any new updates on the message board. creating a generic function startConn function which passes the JSON information sent from the server into a callback function, then sends another request to the server using the link returned from the callback function. Using sqlite3, create a table called messages with a few fields, mainly the message content msg_content and the timestamp, for retrieval purposes, msg_time. This creates a web.py app, which is run on port 8080 (by default). In any browser, go to localhost:8080 and you will see a header welcoming you into the world. Next we will work on the interface for submitting messages to the server. This will just be a simple form where there is a textarea for typing messages and a simple submit button. Create this file as form.html under the same directory as the main server file. For the main server script, we will add a few lines to serve this form.html when users visit the page /add, then we will also add a POST function so as to retrieve the message content and then put it into our database. The main page, when first visited will show all the messages, then connects to the server to see if there is any new messages to load. To do this, we make use of web.py’s templating system to create a index.html, and dynamically load all the message content onto the website when it loads. To retrieve new messages, a request is fired to the server and it searches through the database for new messages. And here is the important part, when the server sees that there is no new message, it simplys wait and search again later. To relieve load, a staggering effect is used, where with each failure, the staggering time is increased, until a valid response is received This is how the long polling is achieved. Well, with everything done, save all the files, then run the server file. Add a message on localhost:8080/add and then watch the index page refreshes and updates all the messages automatically. However, the limited webserver that web.py uses means that it is unlikely that it is capable of supporting multiple long poll request at a time. So next time, I will be teaching you how to setup web.py with lighttpd to handle these request smoothly.